We can register most Community Interest Companies, and we are an agent for Co-operatives UK and can register any society using their model rules. However, we also provide our own rules - multistakeholder social co-operatives, also known as the 'Somerset Rules'. - they enable a co-operative enterprise to be 'shared' by more than one group of stakeholders - for example, a community supported agriculture scheme could be 50% controlled by producers, and 50% by consumers. Or a business could be 60% controlled by its workers, and 40% by the local community. - they are designed to enable the widest range of options for financing your co-op by issuing shares to members, and to outside investors. - they closely follow co-op principles - even those like education and sustainable development that are often not referred to in rulebooks. - they are 'social accounting ready', so that future co-operators must evaluate their success at achieving the co-operative's stated mission. We should say that in many cases - maybe most cases - the model rules that are already widely used are perfectly satisfactory. However, we think these new rules will open up new possibilities for co-operative enterprise. In 2012 and 2014 we fully revised and overhauled the rules, and developed a version for use as a Community Interest Company limited by guarantee, and another for Community Benefit Societies. More recently, we have looked at the use of the rules with Social Enterprise Mark accreditation, and FairShares principles - see below. See the files below for more information on when these rules might be useful and how to go about adopting them. Existing co-ops wishing to convert can follow the same process as for registration, but note the lower charge and let us know your current registration details. You will also find examples of membership policies, standing orders and first year social accounts, which may be useful as templates for your own organisation. The Social Enterprise Mark is a badge of best practice in ethical business: the Somerset Rules can be used as a sound basis for an SEM compliant business. It is also ideal for co-ops wishing to use the Co-op Marque in their marketing. Click for details. 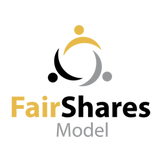 The FairShares Model is a philosophical basis for businesses that distribute rewards fairly among stakeholders including founders, workers, consumers and investors. Click here to find out how to use Somerset Rules as the basis for a FairShares enterprise.